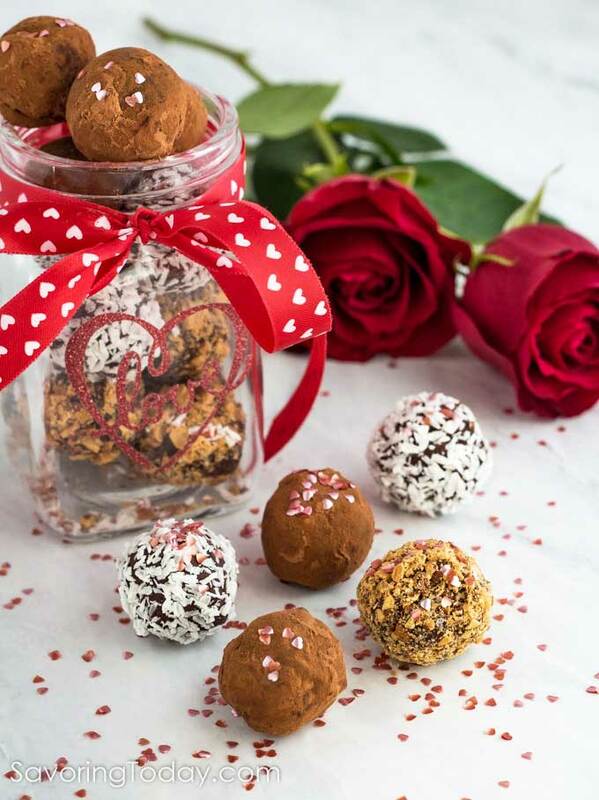 Create an easy Valentine treat to delight your sweetheart with just 5 basic ingredients. These homemade chocolate truffles say, “You’re special to me,” without being complicated. Chocolate desserts are at the top of our must-have list for Valentine’s Day. This truffle recipe delivers velvety chocolate bliss that satisfies every time. With only a handful of ingredients and a few basic steps, you’ll be on your way to hero status in the love department! Customize this easy chocolate dessert with unique flavor add-ins, WOW-able textures, edible decorations, or for specialty diets, too. Traditional – substitute butter for the coconut oil. We like the smooth, (hardly noticeable) light flavor of coconut. However, butter may be preferred if any hint of coconut is not wanted. Milk chocolate – reduce the bittersweet chocolate to 1/2 cup and increase the semi-sweet chocolate to 1 1/2 cups. Dark chocolate – reduce the semi-sweet chocolate to 1/2 cup and increase the bittersweet chocolate to 1 1/2 cups. Intensify the chocolate flavor by adding 1 teaspoon instant espresso to the melted chocolate. For the most smooth, creamy texture, use plain unsweetened cocoa powder. For distinct texture, roll in crushed nuts, peppermints, pretzels, shredded coconut, or toffee—you’ll want to chew instead of letting it melt in your mouth. 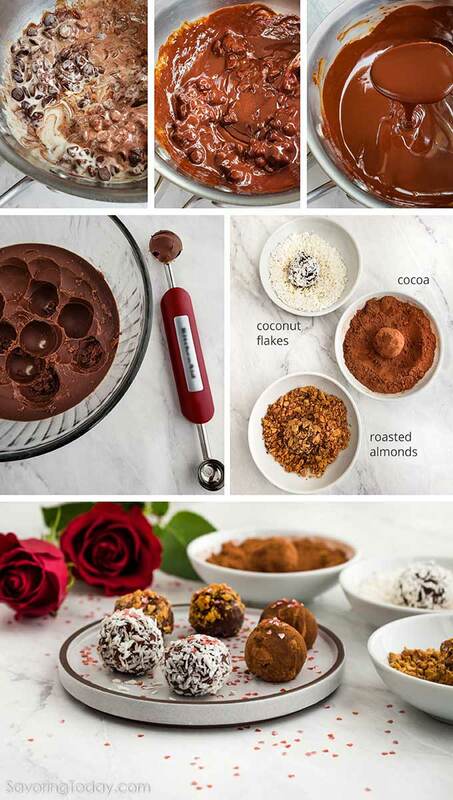 Create a shell by rolling in melted chocolate—just be sure to freeze the truffles before applying a chocolate coating so they don’t melt in the process. What’s Valentine’s Day without a heart shaped themed treats?! We like these because they are not crunchy or noticeable when eaten—they are tasteless and feathery light in texture so they don’t interfere with the silkiness of the truffle. Gold glitter flakes or gold hearts, stars, or any edible sprinkles can be used to create your own unique gift. 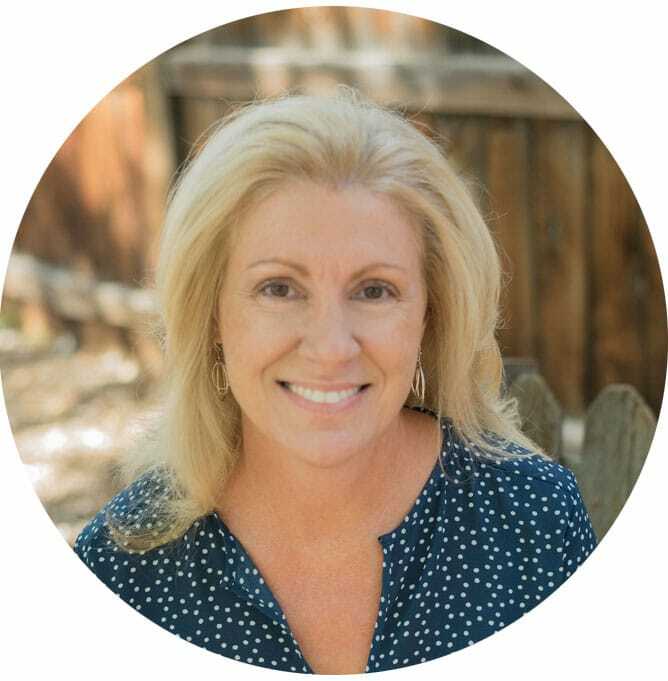 Gluten-Free – our recipe ingredients are naturally gluten-free, but if you are making them in a kitchen that could pose cross-contamination, be sure to wash all surfaces, mixing bowls, pans, and utensils. Dairy-Free – substitute coconut cream for the heavy cream. Vegan – substitute coconut cream for the heavy cream and use vegan chocolate chips (see below). KETO [Low-Carb] – use Keto-friendly chocolate chips (see below). Paleo – substitute coconut cream for the heavy cream and use paleo-friendly chocolate chips (see below). are available in milk, dark, and white chocolate in most grocery store baking sections. It melts easily and makes a delicious truffle. We’ve used Ghirardelli for chocolate covered strawberries too. is an excellent option for anyone following a vegan or Paleo protocol or have allergy concerns. You can print a coupon for in-store purchase if you submit your email address here. are also vegan and can help you tackle the KETO challenge with their line of chocolate bars. Note: When using the dark chocolate chips, remove from heat as soon as the chocolate begins to melt and continue stirring. Mixture will not be as smooth, but will roll just fine. Ultimately, if there’s a brand you already know you love, use that. is the easiest way to scoop the chocolate into semi-rounded balls. If you don’t have a melon baller, you can use a regular teaspoon to scoop out bite-size amounts of chocolate and form the balls by rolling the chocolate between your palms. The truffles don’t need to be perfectly smooth. In fact, they’re not supposed to be. Mix heavy cream and coconut oil in a small pot over med-low heat about 5 minutes or until it begins to bubble. Remove from heat and add the chocolate, vanilla, and salt. Stir until the chocolate is melted and smooth, about 3 minutes. Refrigerate at least two hours, or until mixture is firm to the touch. Use a melon baller to create balls of chocolate about the size of a quarter. Roll each ball in your hands to round and smooth, but don’t worry about trying to make them perfectly round. Coat by rolling and pressing lightly to help chunkier coatings to adhere. Store chocolate truffles in the fridge for up to 3 months in an air-tight container (you don’t want them tainted by odd refrigerator odors). Remove from the fridge 1 hour before serving (colder truffles take longer to melt on the tongue). Store truffles at room temperature for 2-3 weeks in an air-tight container. If stored at room temperature, choose a cooler part of the room so the truffles aren’t too soft to enjoy. Freeze prepared truffles for up to 6 months in an air-tight container, just wait to apply any coatings until closer to the time they’ll be eaten. Silky smooth chocolate truffles for a decadent bite-size Valentine's Day dessert. Stir 1/3 cup heavy cream and 1/3 cup coconut oil in a small pot over med-low heat about 5 minutes or until it begins to bubble. Remove from heat and add 1 cup semi-sweet chocolate, 1 cup bittersweet chocolate, 2 teaspoons vanilla, and salt. Stir until the chocolate is melted and smooth, about 3 minutes. Pour into a shallow bowl and refrigerate at least two hours, or until mixture is firm to the touch. Prepare desired toppings and place in separate bowls. Once the chocolate is firm, use a melon baller or a small cookie scoop to create balls of chocolate about the size of a quarter. Roll each ball in your hands to round and smooth, but don't worry about trying to make them perfectly round. Roll each truffle ball in desired coating, pressing lightly to help chunkier coatings to adhere, and arrange in an air tight container to store in the refrigerator until ready to serve. Allow to sit at room temperature for 10 minutes before serving for a silkier texture. If you don’t have a melon baller, you can use a regular teaspoon to scoop out bite-size amounts of chocolate and form the balls by rolling the chocolate between your palms. If the chocolate is too hard to scoop, allow to sit at room temperature until it is soft enough to easily roll and shape. 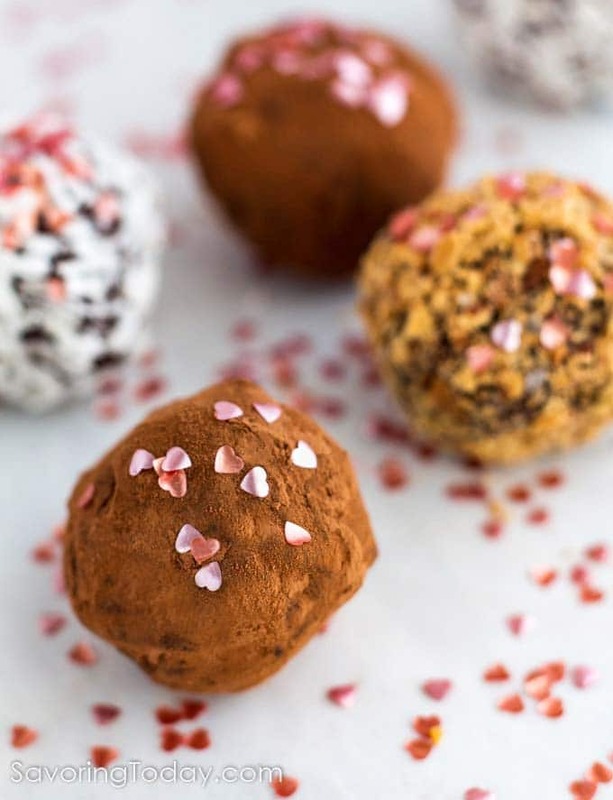 Store chocolate truffles in the fridge for up to 3 months in an air-tight container (you don’t them tainted by odd refrigerator odors) Remove from the fridge 1 hour before serving (colder truffles take longer to melt on the tongue). Store truffles at room temperature for up to 2 weeks in an air-tight container. If stored at room temperature, choose a cooler part of the room so the truffles aren’t too soft to enjoy. Dairy-Free – substitute coconut cream for the heavy cream and Enjoy Life brand chocolate chips. Vegan – substitute coconut cream for the heavy cream and use Enjoy Life or Lilly's Sweets brand chocolate chips. KETO [Low-Carb] – use Lilly's Sweets brand chocolate chips. When using the dark chocolate chips, remove from heat as soon as the chocolate begins to melt and continue stirring. Mixture will not be as smooth, but will roll just fine. Paleo – substitute coconut cream for the heavy cream and use Enjoy Life brand chocolate chips. I just love a great easy recipe, and you can’t beat easy truffles! Only 5basic ingredients?! Sounds great to me – easy to make and quicker. The truffles look incredible though! These look truly delicious!! And I love all of the options for toppings and versatility! These look so delicious! And, I love how they can be modified to fit so many different diets! I pinned these and will be making them soon! I love that these have clean ingredients yet look ssssoooooooo amazing! Yum! I make something very similar to these, I love all of the options for flavoring them! 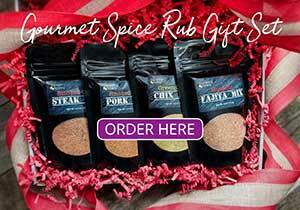 These are perfect for Valentine’s Day1 I love all the varieties & options you have. What’s not fabulous about making our own truffles? Great article with lots of good tips. Once upon a time, when I had my shop, we had so much fun making these and my clients loved the little heart-shaped containers we put them in. So sweet + delectable. Thanks! Super yummy and pretty and fun! I Love the ways these can be customized! I love the inside flavor options and all of the fun topping ideas! These look so fun – my girls will enjoy making these special treats! I love chocolate and these adorable truffles look so sinfully delicious! I love all the delicious options. I’ll take them all! So gorgeous and decadent! Can’t wait to try these out;. decadence in a sweet little bite!! Oh swoon! Too easy to whip up too! Those look like a delicious treat! Great for gifts! I want to give these to all my girls! Ohh yes to these! Great gift for any loves one, friend or galentine! Judy, you’ve got great tips on how to make the truffles with lots of varieties…something for everyone. 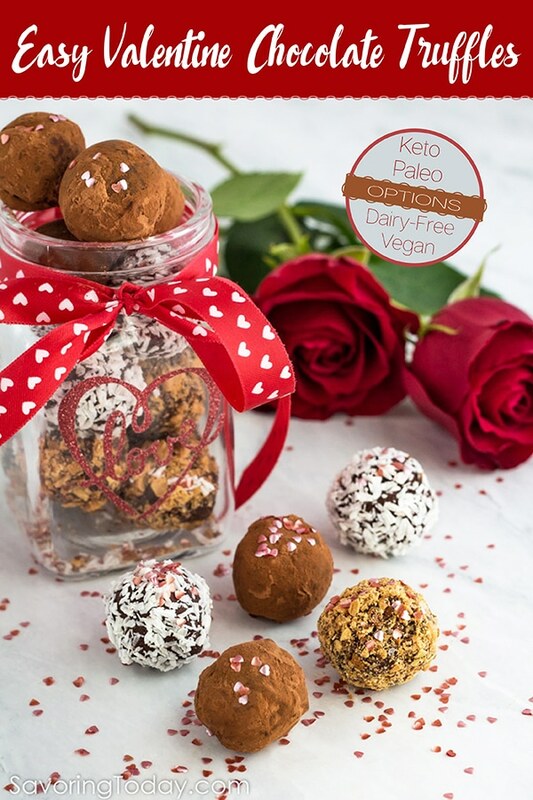 Oh my goodness…it’s hard to think that Valentine’s Day is just around the corner, but your truffles make me want it to hurry up and get here. All of these truffles look totally irresistible. Thanks for all of the great tips. I’ve never made truffles so your information is invaluable.